It's a bento box, Charlie Brown. 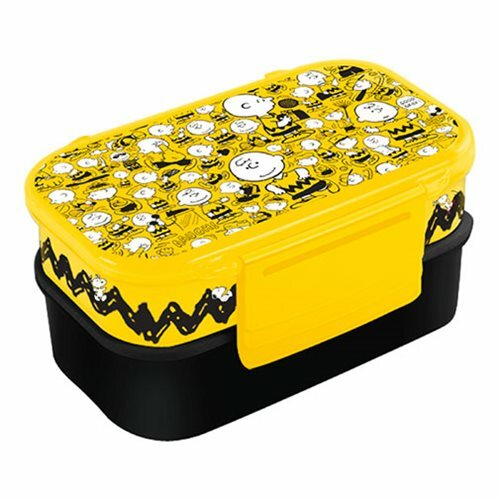 Designed with a kid-friendly, easy-open lid, this cute and colorful Peanuts Charlie Brown Bento Box sporting a host of different images of the lovable loser makes lunch time or snack time fun! Lightweight, practical, and reusable, the three compartments keep food separated and fresh, and the snap-closure is easy to open and close. The box is made of durable plastic and measures about 7 9/10-inches wide x 5 1/10-inches long x 3 9/10-inches tall. It's easy to clean with soap and water and dishwasher safe. Do not microwave.